E1: the fastest pulse produced by gamma radiation ionizing the upper atmosphere travels at 90% of the speed of light and is the most destructive pulse. Weaponized “Super EMPs” are reportedly able to exceed 50,000 volts per meter which makes the E1 pulse effective on virtually any electronic device, but this is unconfirmed and possibly classified. Regardless, the E1 pulse travels faster than most surge protectors are able to operate. E2: the intermediate pulse is produced from gamma rays and neutrons and is similar to the surge produced by lightning. Because of this, protection designed for lightning also protects well against the E2 pulse. E3: the slowest pulse that can last hundreds of seconds after a detonation. This is caused by a temporary distortion in the Earth’s magnetic field. It is similar to a solar flare or coronal mass ejection. Long electrical conductors such as power lines and transformers will be damaged by an E3 pulse. 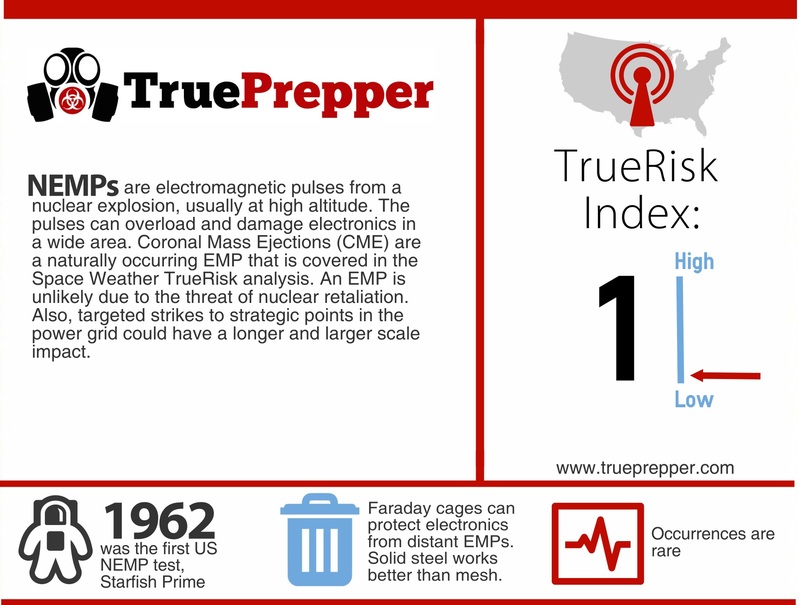 The TrueRisk index puts an EMP risk as a 1. This does not mean that the risk is negligible or non-existent, it merely means the other risks on the index are prioritized. An EMP driven TEOTWAWKI event has been somewhat romanticized by some preppers, but the data shows that the chances of one occurring deliberately are on the low end of the scale. One of the major factors related to this low ranking is that an EMP event does not cause direct harm to life and limb, such as a ground burst nuclear strike. The fact that NEMPs are viewed by the Department of Defense as a nuclear attack, and therefore subject to nuclear retaliation strikes makes the odds of a enemy country using one very low. Military hardening against EMPs and resource dispersal over the years has ensured that retaliation will be able to take place. That said, if a group were bold enough to use an EMP, they would target large urban areas or military sites. If you live close to either of these areas, your risk of exposure to an EMP is slightly elevated since your own electronics would be affected. The majority of the risk of an EMP is not tied to your own electronics, but the electronics that sustain society at power plants, water treatment facilities, and food distribution. EMPs are relatively simple to prepare for. As with many attacks and disasters, basic survival kits and plans are the cornerstone. Hardening your personal electronics using faraday cages can help, but a low priority when looking at the possible damage on a larger scale. EMPs can disable vehicles, so being able to return to your home if your vehicle becomes disabled should be planned for as well. Prioritize a survival kit over all other kits when preparing for an EMP. Disruption to supply chains, water supply, and the electric grid are the highest impact results for an electromagnetic pulse. Electrical hardening includes resilient electronics and Faraday cages, for the most part. Electromagnetic pulses can cause all sorts of damage and chaos, but they aren’t as dangerous to your life as other TEOTWAWKI events. A solid bug in and/or bug out plan that is flexible should be enough to handle an isolated event. If it is a wide scale attack, being resourceful and flexible to change with the future is the best plan. NEMPs are a result of a nuclear detonation so you first need to be concerned with the ‘detonation’ part of the equation. Know that a shockwave can still be present and seek cover immediately if you have any forewarning. If you need to get equipment into a Faraday cage, you need to act very quickly depending on how much notice you have until detonation. The NEMP is composed of three components: E1, E2, and E3, so you should be prepared to stay protected through all three components and distance yourself from electronics. Check the status of yourself and your family first- do not assume that no harm can come from the blast. Ensure that the EMP discharge is complete by waiting several minutes after the blast. Once you have accounted for everyone and everything that is vital to survival, you can begin testing your electronics. Visually inspect for damage before trying to power on any devices. Grounding yourself and the equipment is good practice, but even more necessary after EMP exposure. Communications equipment is particularly susceptible to EMPs but important to obtain information in survival scenarios. If your communication equipment is working, it is a good idea to try and determine the extent of the damage to other’s equipment to get a bearing on how bad the attack was.